I love my custom MAC eyeshadow palettes, I have one full 15 palette and one full quad and then I have one 15 palette that's half full of shadows that I don't often reach for, I use my quad mostly as it contains the 4 MAC shadows I use the most. When MAC first launched their X 9 palettes I really didn't think I'd be interested in them, there are 4 palettes in their permenant range, Amber, Burgundy, Navy and Purple and MAC do launch limited edition X 9 palettes in some of their collections too, I also have the MACnificent Me X 9 which was limited edition and is stunning, I do have a post and some exciting news regarding that palette coming very soon. But as I said when MAC launched the X 9 palettes I just wasn't too bothered, I thought I had all the shadows I wanted and didn't think anything else of it, until that is my daughter gave me a MACnificent Me palette, she had 2 so gave me one and I have used it to death since I got it and because I use it so much my daughters kindly bought me the Amber X 9 palette for my birthday. The X 9 palettes contain 9 eyeshadows that are around I'd say the size of a 5 pence piece, they are priced at £30.00 and each pan contains 0.8g, a full size MAC pan eyeshadow refill contains 1.5g so there is just over half the amount of product in the eyeshadow pans in the X 9 palettes than in the full size eyeshadow pan refills but considering 9 full size pan refills would be £90 plus a palette to put them in which is around £12.50, I think the X 9 palettes are a pretty good buy for £30.00. The actual palette is the same size as a MAC quad so ideal for travelling, they are compact enough to fit into a makeup bag but contain 9 shadows so ideal for travelling and the shadows in all 4 of the palettes are stunning. In the Amber palette there is a nice mix of matte, frost and lustre shadows with 1 velvet and 1 satin shade, the colour mix of the palette is beautiful and there isn't a shade I don't use which is rare for me with a palette, usually theres at least 1 or 2 shades I don't reach for very often if at all but I love all the shadows in the Amber X 9. All the shades in the palette apply well, some are more pigmented than others but they all have a great colour payoff, apply well and blend beautifully, some can be worn alone as a one shadow look, applying to the lid and blending out and then to the lower lash line and others look great together, I love that the palette can be used to create subtle neutral day looks and also dramatic smoky evening looks, I wouldn't usually choose warm toned eyeshadows but I really like all the shadows and they all look lovely on and last all day without creasing (I do wear an eyeshadow primer with all eyeshadows as I have oily lids) I am really happy with the palette and I find myself reaching for it a lot when I apply my makeup. 1. Cozy Grey - Matte - really lovely shade and a great transition shade, the swatch doesn't do it justice at all, it is much darker on the eye, it's a lovely taupe with grey tones. 2. Kitties - Frost - again the swatch isn't great but it does transfer really well on the eye, I like to wear this on the lid or in the inner corner, it's a yellow toned gold. 3. Georgia Peach - Matte - a lovely deep peach shade with brown tones, looks great as a transition shade or a one shade eye look. 4. Rice Paper - Frost - you can barely see this on the swatch but the colour payoff on the eye is lovely, makes a lovely lid and inner corner shade, a yellow toned gold. 5. Creative Copper - Lustre - a lovely bronze with gold tones, looks lovely all over the lid or blended into the crease. 6. Cork - Satin - lovely warm toned brown shade, ideal for a crease shade or under the lower lash line to add some depth. 7. Don't Tell - Lustre - a lovely brown with copper tones, looks lovely all over the lid with a deeper brown in the crease. 8. Aromatic - Matte - lovely deep brown shade with warm undertones, lovely crease and lower lash line shade. 9. Pepper Please - Velvet - a gorgeous deep brown with reddy undertones and gold sparkle throughout a matte shade, it's stunning and looks gorgeous as a one shadow smoky eye or blended into the crease. 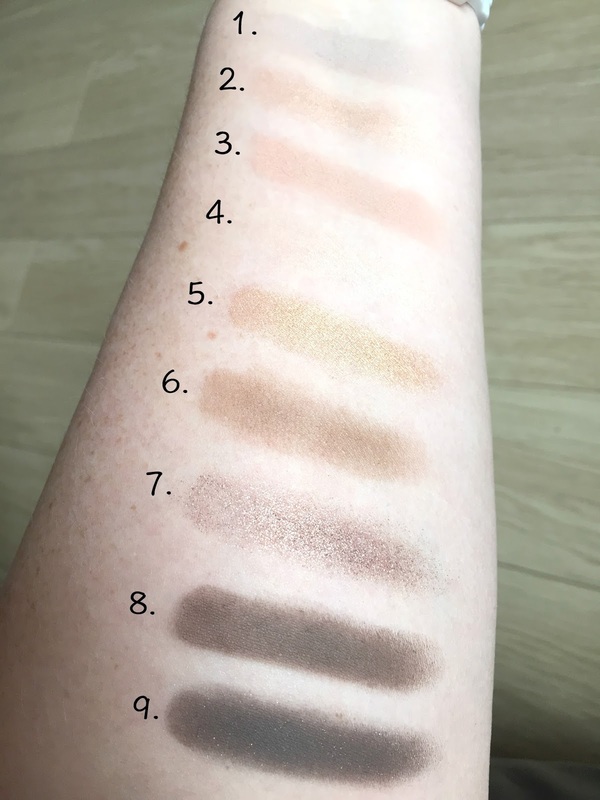 Some of the swatches in the photograph really don't do the shadows justice, all the shadows have great colour payoff on the eye which is the important thing but it is disappointing when something doesn't swatch well, I am very pale too so it doesn't help with the paler shades. All the shadows are stunning and I love the mix of colours and finishes, they all go really well together, if you like neutral eyeshadows I'd definitely take a look at this palette even if warmer tones aren't usually for you, I never choose warmer toned eyeshadows but I really like this palette, all the shadows apply well, blend beautifully, wear well and look lovely, it's a really lovely little palette. You can find the MAC Amber X 9 palette on the Debenhams website HERE for £30.00 or on the MAC website HERE for £30.00. Have you tried any of the X 9 MAC palettes? Which one of the 4 permanent palettes is your favourite? Chat with me in the comments and let me know, I'd love to hear your thoughts.